I’ve often heard said that art doesn’t have to match your sofa (or your room, for that matter). The thought is that the la-tee-dah art is so much more important that your furnishings and other decor that making sure it matches is an insult. 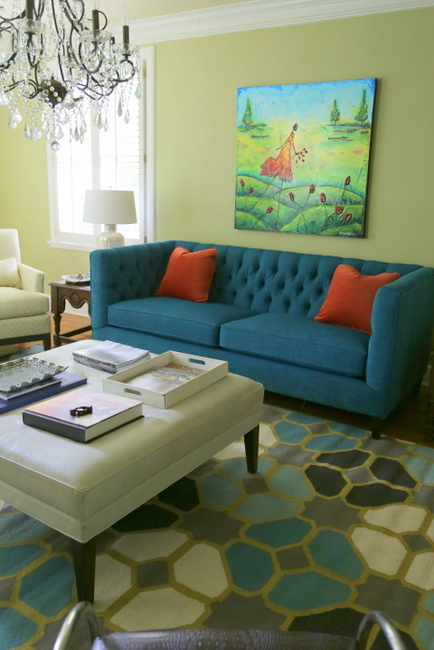 I believe it’s an insult not to consider the size, shape, and colors of the art when choosing it for a space. Don’t you want the art (and room) to look as good as possible? This huge room was rarely used, and my clients were considering changing the space into a play area for their children. There is an adjoining breakfast room that is large enough to accommodate the existing dining room table, minus a leaf. They already had an informal den in the home where they hang out and keep toys. After discussing ideas for awhile, I talked them into creating a grown-up living room and using the less-attractive den as the dedicated play area for children. Are y’all ready for this? 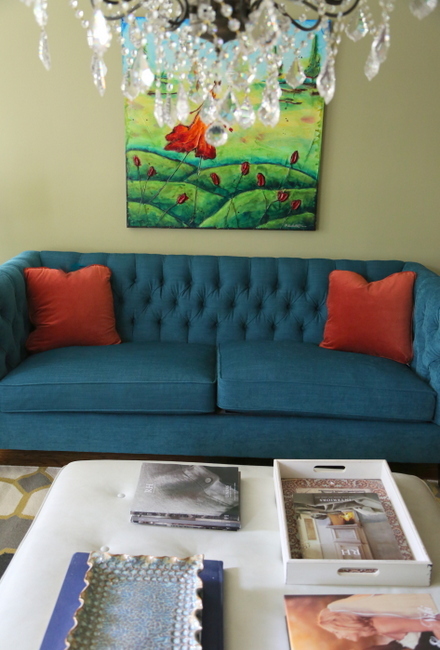 Let’s talk about the choices we made in this space – first, there was a special piece of artwork hanging in the home that we decided we wanted to use above a new sofa. The colors in it were vivid and fun. In order to make that piece of art sing, we developed the color palette to complement the art. Art is highly personal. I rarely choose art for clients, except to tell them what size, shape, and colors I recommend they look for in a given space or on a given wall. When they already own a special piece that they definitely want to use in a space, I take it under consideration when choosing paint colors and fabric for the space. 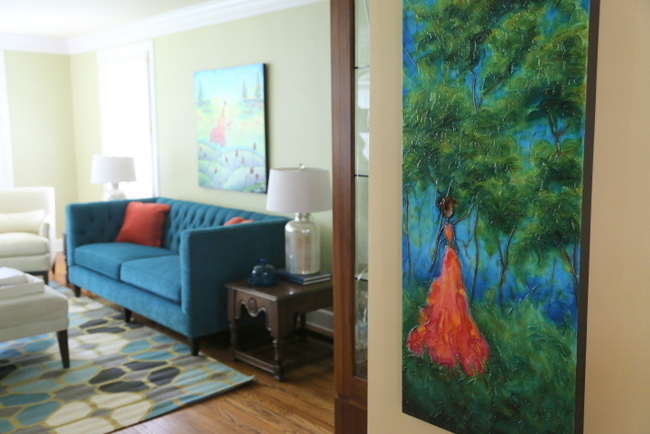 The first thing I chose was a wall color that would blend with adjoining areas and be the right backdrop for the art. The room and adjoining areas were initially a butter yellow. 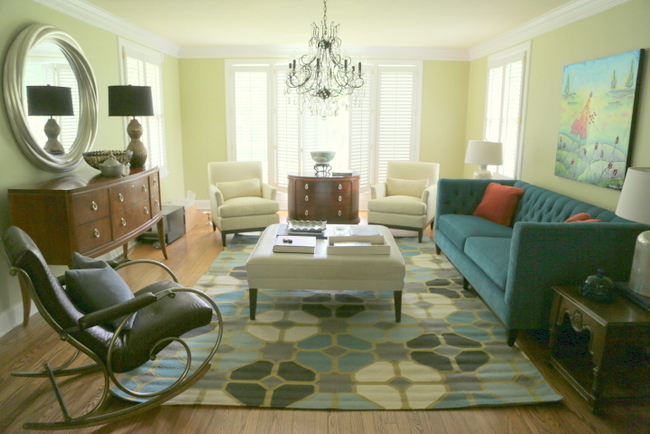 We left the breakfast room, kitchen, and hallways yellow and chose a muted yellow-green for the new living room. 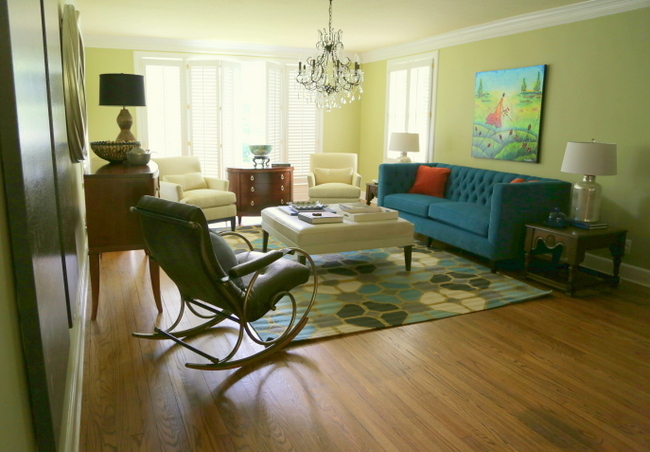 We could have defaulted to a neutral, but this choice made for a sophisticated yet just-a-bit funky space. The ceiling stayed butter yellow as well, and worked out beautifully. This second piece of art by the same artist furthers the cohesion of colors in the space – it’s hung on an adjoining wall with the original butter yellow wall color. 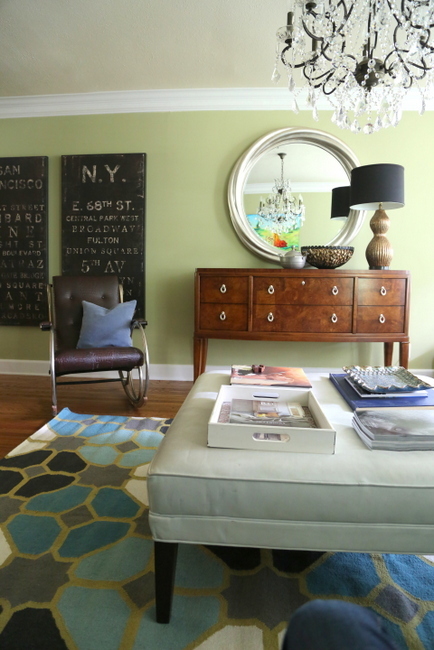 I love how the new rug pulls it all together – the wall color, sofa color, the creamy leather ottoman color, and a few more colors to punch it up. It all works together, without being too matchy. 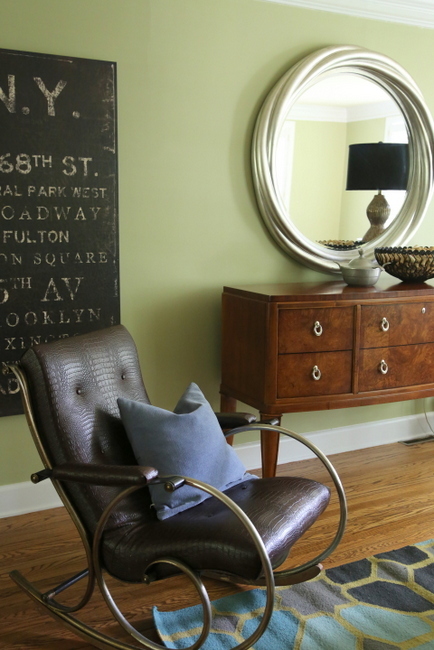 We repurposed the dining room buffet as a console in this room – eventually, a flat screen television will replace the mirror above it. Although the new pair of chairs look creamy from a distance, the fabric is cream with a small pattern of green links. It looks like a lighter version of the wall color. 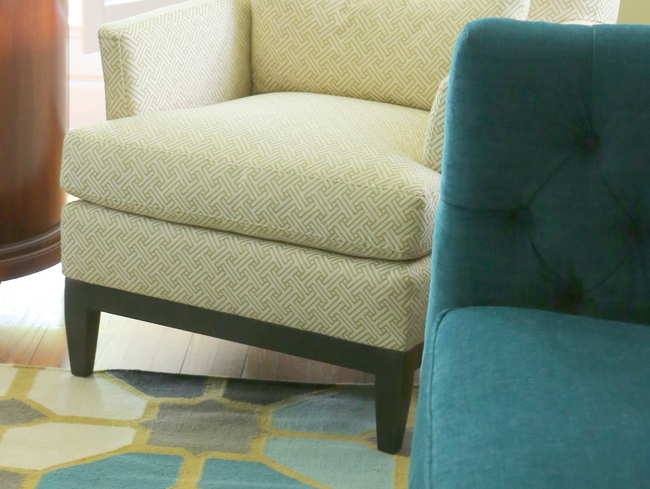 The slim arms give an updated profile to a super-comfortable arm chair. Did I mention that my client is having another baby next week? We got this room installed just in time for the new arrival and visiting family, whew! I think the baby will enjoy being rocked in this beautiful space . 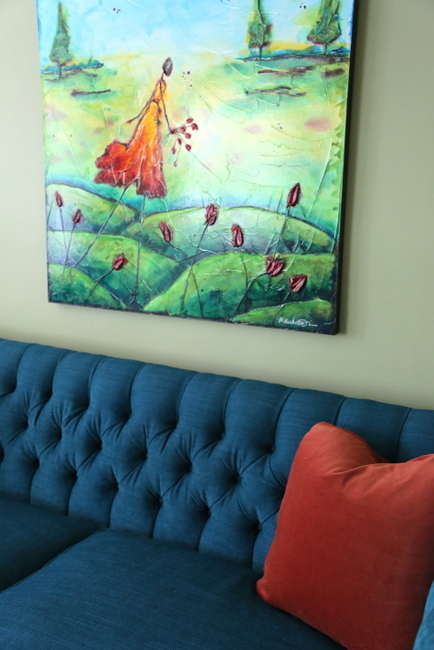 . .
Maybe art doesn’t have to match your sofa. But if it does, the results can be phenomenal. Do you agree or no? Posted on by Kristie Barnett.